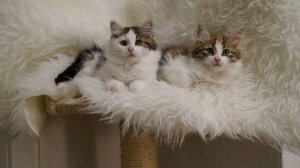 Introducing our stunning little bundles of wonderful Purrfect Little Siberian Forest Kittens.Weaned onto a high grade nutritious diet of Royal Canin dry food. Fed on only the best, no expense spared to ensure the best possible start in life. They're eating & drinking independently & are fully litter trained. Treated against fleas, worms & mites using effective veterinary products to prevent infestations of any kind.Extremely tame, playful & affectionate. Enjoy attention & human contact due to being handled since birth. Amazing temperaments with unique "personality plus" characters. Great around other pet animals.If you would like to offer a loving home where these amazing little creatures can live the pampered life styles to which they are well accustomed, please do contact us.